Epsom town is less than 30min away from Wimbledon and 50min away from Waterloo, making it an excellent living and commuting place for London workers. The postcode map above contains a handy walking distance information (measured in minutes) from any Epsom household to the train station. You will find it pretty useful if you are a commuter looking for a new home in Epsom. As we can see from new 2017 secondary school results, Epsom also boasts a wide selection of high-achieving schools to suit your needs. Out of the 9 schools within a three mile radius of the centre of Epsom, 8 were rated as being either good or outstanding by Ofsted. On top of this, according to Locrating data, 89% of parents with children at these schools would recommend the schools to other parents. 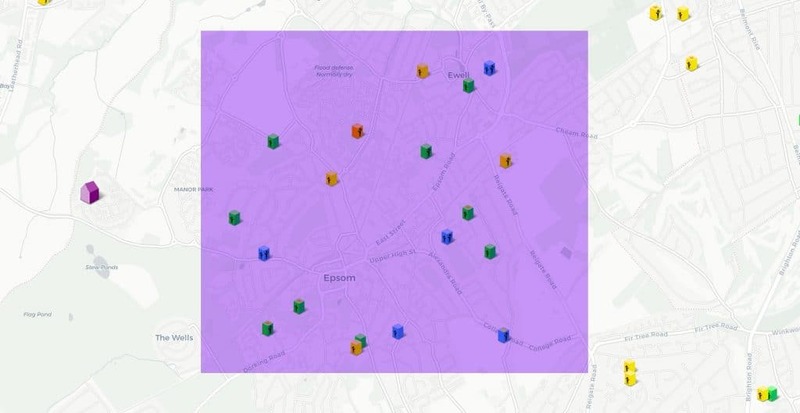 We have carried out a study (through running a residential survey on our database of 10,000 people), which revealed that Epsom town is a pretty good place to live in, with a very appealing score of general area satisfaction! Our findings are based on a number of questions we asked locals to answer in our survey. The questions included scoring their level of satisfaction regarding Epsom town’s infrastructure, shopping, parking arrangements, safety, family friendliness and catering. We will be aiming to repeat the study in 2018 and 2019 to compare the findings year on year and see in what direction is Epsom heading in. Overall how satisfied are you with your neighbourhood? How family friendly do you think Epsom is? Do you think there is the right amount of neighbourhood events? How safe do you feel walking alone in Epsom after dark? How quickly does the local government respond to requests for help from people living in Epsom? Do you think there is a good amount of activities and venues for children in Epsom? Does Epsom high street provide a good experience for shoppers? How satisfied are you with the parks and green areas in Epsom? Overall, how satisfied are you with your local pubs and restaurants? How well are the streets in Epsom maintained? Do you think there are the right amount of neighbourhood events? Has the new 2 way system reduced traffic congestion? What do you think of the conditions of roads and pavements in Epsom? Are you happy with car parking charges? Is the town centre wheelchair friendly?